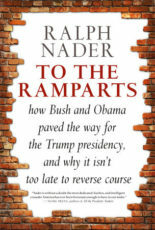 We talk to Ralph Nader about the government shutdown -in its 32nd day already, and about his book To the Ramparts: How Bush And Obama Paved The Way For The Trump Presidency, And Why Ii Isn’t Too Late To Reverse Course. Nader knows them all. Trump didn’t come out of nowhere. Bush and Obama led the way. Then, we speak to Cathi Tactaquin, Executive Director of the National Network for Immigrant and Refugee Rights. She gives an update of what the Senate Bill on immigration is about and what Trump proposes to negotiate for his wall. Catherine Tactaquin is Executive Director of the National Network for Immigrant and Refugee Rights.